This condo and boutique complex (only 8 units) offers its guests all the amenities of a condominium vacation without sacrificing privacy. 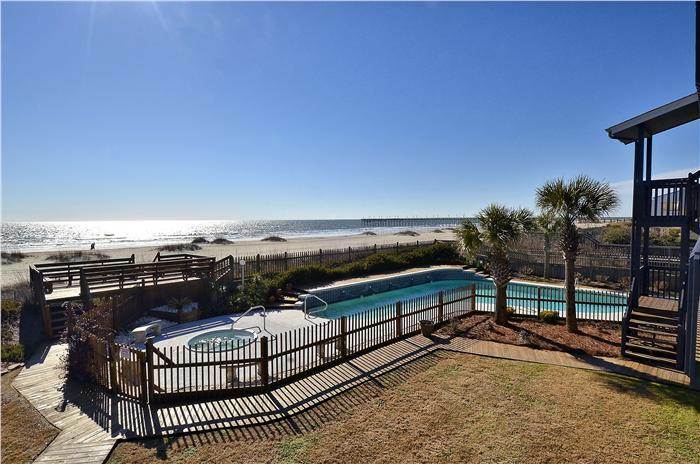 OCEANFRONT three bedrooms, two baths, fully equipped kitchen with granite countertops, dishwasher, microwave, Keurig coffee maker, laundry room, and ceiling fans throughout. Wifi, 4 flat panel televisions , DVD player, HBO. Kid friendly with 2 bed rails, 2 Pack N Play cribs, a high chair and kid kitchen utensils. Modern updated bathrooms. Beautiful new furnishings, bedding, and decor. Large private deck with expansive ocean views. Easy access to the complex's oceanfront pool and spa. Private beach access and covered parking spaces. Walk to fishing pier, restaurants, and shopping. Stay here once and you will want to come back year after year! Sleeps: 8 Bedding: King, Double/Single, Double/ Single. All bed and bath linens included in the rental rate. Non-smoking, no pets.